Biometric technology has evolved as automated access monitoring system for accessing behavioral or physiological characteristics to authenticate users using different services. Automotive sector is emerging as one of the key areas in the biometric access systems. The applications include door and window opening, starting of engine, accessing navigation …..
Biometric technology has evolved as automated access monitoring system for accessing behavioral or physiological characteristics to authenticate users using different services. Automotive sector is emerging as one of the key areas in the biometric access systems. The applications include door and window opening, starting of engine, accessing navigation system and others. The most common biometric systems used in the auto motives are fingerprint and voice recognition systems. This system facilitates the vehicle owners in providing better anti-theft protection and comfort. Fingerprint recognition system is the leading revenue generating segment based on the authentication type. Based on the end users, consumer vehicles hold major share of the market of around 90% in 2015. Majority of the automobiles have pre-installed biometric systems, as the major players in automotive industry have collaborated with hardware providers to provide such systems in their vehicles. Europe is the major revenue generating region across all geographies; however, Asia-Pacific has emerged as the most lucrative market owing to the booming automotive industry in the region. Major automotive manufacturing companies such as BMW, Mercedes-Benz, Volkswagen and Ford have started introducing the biometric technology; however, in the earlier phase, the installation of such systems is limited to the luxury car segment. The accuracy with high end protection, quick processing & easy tracking and recent boom in automotive sector are some of the major drivers for automotive biometric access system market. However, the cost of installing and availing the functionality and limited awareness among the end users have restricted the wide speared adoption of biometric access system in automotive sector. The market for automotive biometric access system is segmented based on the authentication type, characteristics of the system, end users and product sale type. 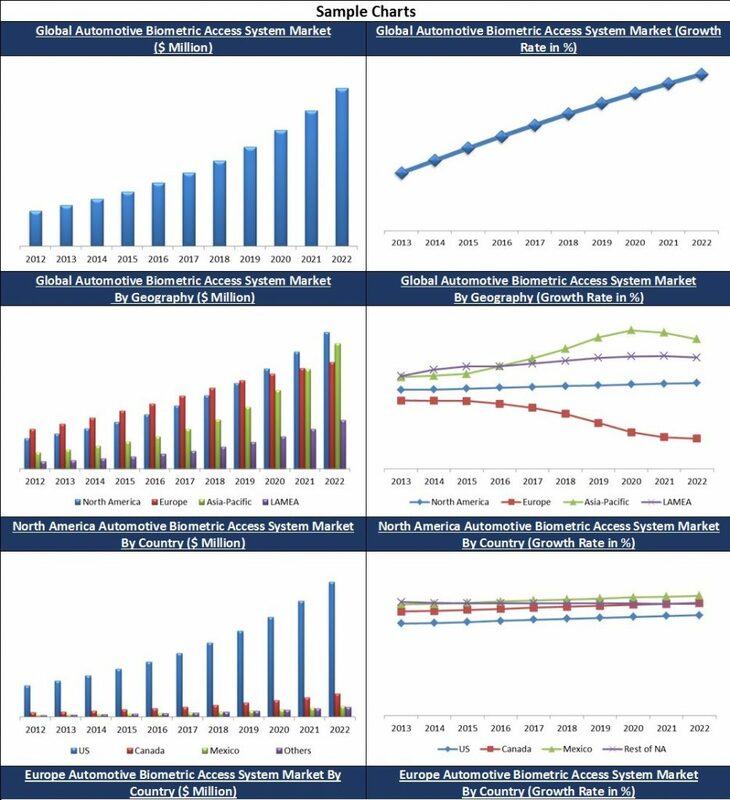 The report also highlights the market of automotive biometric access systems across different geographies which include North America, Europe, Asia-Pacific and LAMEA (Latin America, Middle East and Africa). The report covers the analysis of key stake holders of the automotive biometric market. Key companies profiled in the report include Delphi Automotive Plc., Ford Motors Corporation, Synaptic Incorporated, VOXX International Corporation, Hitachi, Ltd., Fingerprint Cards AB (publ) and others. TABLE 351 DELPHI AUTOMOTIVE PLC. TABLE 374 VOXX INTERNATIONAL CORPORATION.